Dang Magazine is looking for writers. If you are interested, apply as quick as possible! They are also hiring, so apply quickly! Long time , no see..I know. This blog is getting more and more active so I apologize for that. 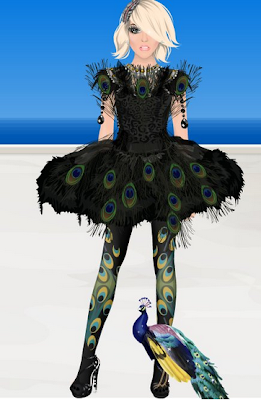 The Alter Ego's Of Stardoll is a brilliant new project owned by Ciaraleanne . It basically gives you the chance to create your own Alter Ego! If you go to the blog , you will be immediately blown away by just looking at the thing! Thats what I felt like anyway , and thats before I read anything! You can apply to be a writer for the blog. Do it , I already did! Your alter ego could be someone the complete opposite of you , or the real you. Go to the blog , here and go to Ciara's suite here . She made a beautiful design inspired by a peacock. This the perfect example of how a stardesign can be as amazing or even better then a piece from the starplaza. She looks stunning! Keep up with the good work teusa, I'm a fan of your designs! © Copyright IrishLily09 and tailsluvscheese. Watermark theme. Powered by Blogger.